Señorita Miss Cicero Kate Gonzalez was always encouraged to dream big. “My parents always taught me to dream big, to step outside of my comfort zone in order to achieve my dream,” said Gonzalez, 19, who is currently enrolled at University of Illinois at Chicago majoring in Criminology and Communications. “My ultimate dream is to become an actress. I love to sing, dance, and be on stage so I am beyond excited to have been chosen Señorita Miss Cicero because I feel like this experience is once in a lifetime that will be such a tremendous positive impact on my life.” For the next year, Gonzalez will step into her new role with enthusiasm and vigor as she attends an array of events from Fiestas Patrias, Toys for Tots, Cinco de Mayo and so much more. “I cannot wait. I’m a little nervous, I have to admit, but I’m looking forward to growing from this experience,” said Gonzalez who visited the Lawndale Bilingual News office recently. 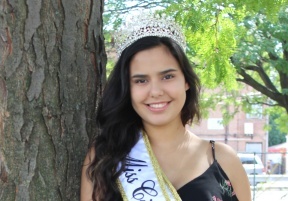 Gonzalez shared what she is looking forward to the most this year and her experience competing for Señorita Miss Cicero. Lawndale Bilingual Newspaper: When did you decide to compete in Señorita Miss Cicero? Kate Gonzalez: I found out last minute. I was told by a couple of people I should participate, but my mind was focused on my dad’s health because it was around the time when my dad was really ill. Once everything settled, I decided to meet with Frank Aguilar and his team to talk about Señorita Miss Cicero and I loved what I heard about the experience. So I decided to compete. Lawndale Bilingual Newspaper: What was your experience like competing in Señorita Miss Cicero? Gonzalez: I had the best time meeting a whole group of girls. I made new friends and it was such a positive environment because we all supported each other. No one tore the other person down. No one was negative. We were a genuine group of girls that cheered for the other person. I learned a lot from them, from their positivity. It was also a great experience developing my character because I had to overcome my nerves. Lawndale Bilingual Newspaper: What does Señorita Miss Cicero mean to you? Gonzalez: Señorita Miss Cicero is more than just a pageant. It’s more than just looking pretty. It’s about being a role model, it’s about representing your community with grace and dignity. It’s about following your dreams no what matter what. It’s about believing in yourself and using what you know to change your community. Señorita Miss Cicero gives you an opportunity to, hopefully inspire and encourage young girls to follow their passions. Lawndale Bilingual Newspaper: As we celebrate Mexican Independence Day and Hispanic Heritage Month what does being Latina mean to you? Gonzalez: Being Latina is about never forgetting where you come from. Never forget your roots. I am proud of my heritage. I am proud to be Mexican. My parents have always taught me to never forget my roots, my language, my heritage. We shouldn’t be ashamed to embrace our culture. We are a vibrant community with a lot of love, wisdom and we contribute so much to this country that I am proud to represent my community here in Cicero.